How can I transfer my Outlook contacts to my BlackBerry? "I use Outlook for my email and I just got a new Blackberry smartphone. Is there an easy way to transfer my Outlook contacts to my Blackberry?" RIM, the company that makes BlackBerry smartphones, anticipated your question and offers an easy solution to sync Outlook contacts to your BlackBerry. You will have to install some additional free software on your computer in order for it to work. Once you get the software configured, you can easily transfer Outlook contacts to your BlackBerry as well as adding new contacts to Outlook by transferring them from your BlackBerry. The software you need should have come with your smartphone, but you may want to go to the website and to be sure you download the latest version of BlackBerry Desktop Software. It's a fairly large file, so be sure you're on a fast connection before you start the download. After completing installation of BlackBerry Desktop Software, you will need to make a few configuration changes to the software in order to transfer Outlook data. Under the option to Configure synchronization settings for my desktop program, one of the options is to configure the Address Book for the software. In this case you want to choose Microsoft Outlook. You will probably want to also choose two way sync so that new contacts added to your phone get added back into Outlook each time you sync. 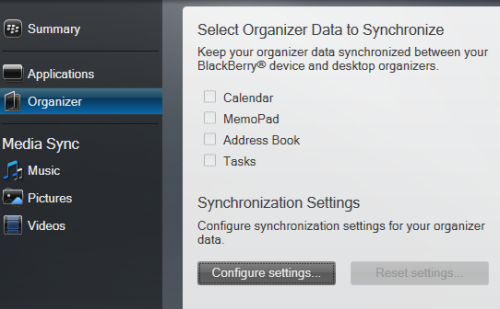 To sync your smartphone to the BlackBerry Desktop Software, you will need to connect it via USB to your computer. Then on the Organizer tab choose which components you want to synchronize. Each time you want to update your BlackBerry using the software, you will need to reconnect to your computer and sync the data.